Even Bear Grylls would think twice! If you’re an inexperienced “mushroomer” who enjoys a hunt of the non-violent kind, you might come across some strange and seemingly inedible mushrooms in your basket when you arrive home. But don't despair! Russian cuisine always has a recipe lurking somewhere for even the wackiest (at first glance) gifts of the forest. WARNING: Consuming some of the types of mushrooms listed below can be dangerous! Red fly agaric is traditionally considered a highly dangerous and poisonous fungus—even die-hard mushroomers often give it a wide berth. More’s the pity! Properly cooked fly agaric is not only safe, but very tasty. 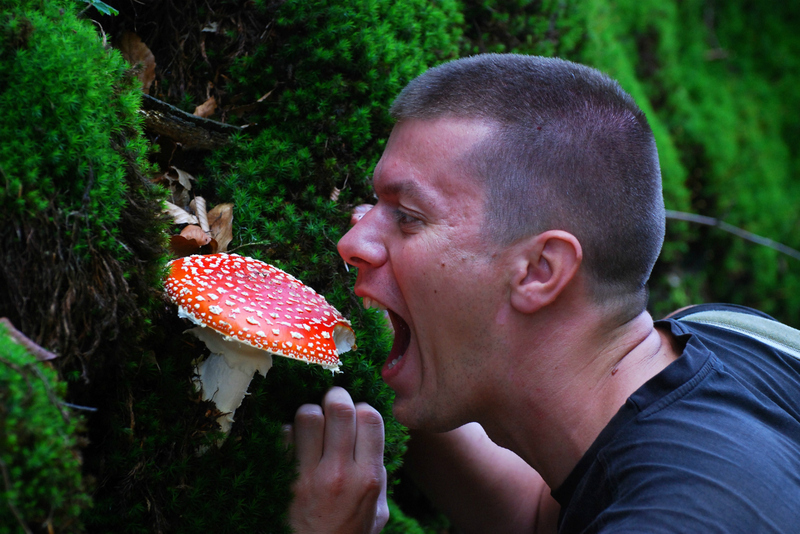 In his short story “Haymakers,” the famous Russian writer Ivan Bunin mentions how Russian peasants happily ate fly agaric, which the nobility believed to have intoxicating properties. To eat fly agaric without poisoning yourself, first of all you need to wash, peel and boil the mushrooms for 20 minutes. The first broth comes out bright orange, since it contains the most dangerous substances. Drain it! To ensure that the mushrooms are totally poison-free, repeat this process 2-3 times. Having lost their distinctive reddy-orange color, they are now ready for further cooking. It’s worth giving them another wash, before seasoning and frying in a pan with finely chopped onions. Best served with sour cream. These bright, unusual mushrooms really do resemble branch-like reindeer antlers or a coral reef. They grow across the whole of Russia, but are consumed mostly in Primorsky Krai in the Far East. As they say in Arkhangelsk, the tastiest “reindeer horns” are picked in October when they have acquired a rich orange or red color, which makes inexperienced mushroomers think they are poisonous. In actual fact, this mushroom is one of the most edible and delicious mushrooms on the planet. “Reindeer antlers” go particularly well with potatoes. To make this dish, the mushrooms should be washed and boiled in salted water for 5 minutes, then fried with onions in a pan until ready. Boil the potatoes, add full-cream milk and butter, and mash into a purée. Heap a few spoons of mashed potato on a plate, make a groove in the middle and lay the fried mushrooms in it. In Arkhangelsk, the dish goes by the name of “mushroom basket.” “Reindeer antlers” are also commonly pickled, although a major drawback is that if you eat more than two tablespoons of mushrooms a day, you could suffer from harmless, but unpleasant stomach pain. The morel is the first mushroom of spring. It has the appearance of a walnut or a very large dried date, and is very common in Russia’s central belt. It doesn’t look edible at first glance, but Russian cuisine boasts a highly original dish to match this unusual fungus. Fern flower salad really is made from ferns. To prepare it, you will need marinated morels, boiled potatoes, young spiral-twisted fern shoots, spring onions and pine nuts. Crush all the ingredients to your taste, sprinkle with your favorite seasonings, and pour on some vegetable oil. To the eye, false morels look very similar to morels, hence the name. But unlike its sister mushroom, it is highly poisonous. In Europe, false morels are considered inedible and dangerous—so much so that they are even banned from sale. But in the USSR they were described as “nominally edible.” False morels are cooked the same way as fly agarics: boil several times, then fry and eat with potatoes and sour cream. The common puffball grows in the first few hours after rain (hence its name in Russian dozhdevik, meaning “raincoat”). In Russian villages, it is also called “granddad’s tobacco,” since mushrooms unpicked for several days turn brown and, if stepped on, burst open, covering everything around with a layer of dark fine dust, which is how the fungus reproduces itself. Only young, white puffballs are used in food. Cooking them is very simple: peel the skin off the washed mushrooms, cut and then fry in butter. The fried mushrooms can also be used as an ingredient for salad; outwardly they look like fried scallops. Although it clearly resembles a toadstool, the parasol is completely edible. The parasol takes its name from the huge size of the cap, which can reach up to 30 cm in diameter. An “unopened” parasol is hard to cook because of its spherical shape, but mature fungi whose caps have grown flat are prime targets for mushroom hunters. For a finger-licking parasol, dip it into whipped egg, then flour, and fry. Cooked this way, it tastes like very juicy chicken! The last place you'll find this type of mushroom is under your feet, since this rare, but very tasty fungus grows on trees. Mushroomers consider it a real forest treasure, which is even thought to have medicinal benefits. The best option for food is sulfur polypore—an extremely attractive bright yellow mushroom with an orange rim. Its properties are similar to activated carbon, since both remove toxins from the body. Polypores are dried, boiled, fried, pickled and even used to make mushroom pâté. For this, fine-cut polypores are boiled for 30 minutes, fed through a meat grinder, salted and then mixed with homemade mayonnaise. The pâté can even be used to stuff boiled eggs, which is very tasty indeed.